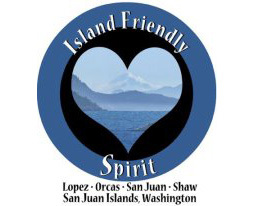 The Walking Trail along the West side of the airport was built by the Port of Friday Harbor, with some assistance by the San Juan Island Trails Committee and Boy Scout Troop 90. It begins on Spring Street just west of the Office Center NW building and continues through airport property and is near Skagit Valley Community College. Part of it is a narrow path along the airport fence and through the woods, and it loops back on a paved road open for emergency vehicles only (walkers welcome) that goes all the way to Shelter Road south of the airport. In 2005 the Trails Committee and airport staff added a loop trail south of Shelter Road connecting to Cattle Point Road near its intersection with Golf Course Road. A great place to stroll or sit and relax while enjoying the stunning view of one of the most beautiful harbors in the Northwest. Fairweather Park is adjacent to the Marina offices and has covered spaces, picnic tables, benches and a small waterfall. In the summer, enjoy an evening or afternoon of Music In the Park. Native artist Susan Point’s red cedar house posts sculpture honors the enduring presence of the Coast Salish people in this area. The sculpture is based on the posts inside a long house that support roof beams. Traditional house posts tell the stories of the family that raised them. The posts were installed in the Port’s waterfront Fairweather Park in 2004 and funded by many generous contributors from the community. Resident harbor seal “Popeye” is named for her one glazed-over eye and has lived in Friday Harbor for about 15 years. She is well known to Port guests and customers. This sculpture was created by local artist Matthew Gray Palmer and funded by the Temcov Foundation. The Spring Street Landing is located at the base of Spring Street and within easy walking distance from the ferry terminal. In the waiting room on Spring Street Landing you will find the 400 gallon marine aquarium, devoted to the appreciation of our local community of marine animals. Fascinating animals collected nearby can be easily viewed inside the aquarium. They characterize the diverse marine biology beneath the docks in Friday Harbor. Different varieties of Perch fish, invertebrates (animals without a backbone) such as sea cucumber and delicate tube worms are represented. Also sprinkled around the aquarium are “singing scallops”, which are able to swim away from danger by jetting water from their shells. The impressively colored slug creatures are called nudibranchs. Star fish, sea urchins and sea anemones provide plenty of interest as well. Details on these interesting animals are explained further on plaques and a notebook attached to the aquarium. 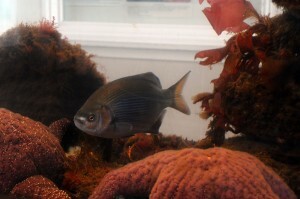 Different species are added to the aquarium throughout the year, offering a unique experience each time people of all ages visit Spring Street Landing. Also, don’t miss taking a peek in an eel grass meadow. The ‘Eye in the Eel Grass’ is a live video feed of a patch of eel grass located in the shallows between Spring Street Landing and the ferry terminal.